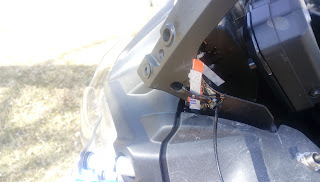 1st task of the morning, after coffee was to start on repairs on my windshield mounts. Both M & I had the same thought overnight. Not having access to a drill, heat tent peg on gas stove amd use it to bore holes so we can use zip ties. Worked perfectly. Bore 4 holes. Apply plastic/nylon glue sourced from hardware shop. Allow to set. Insert 4 x zip ties. Tighten, but not fully. 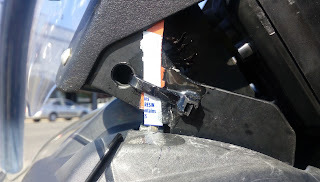 Mix Araldite glue and apply to both sides of break, inserting narrow plastic strips behind zip ties. Tighten and allow to set. Nothing you can't fix with zip ties & epoxy adhesive. All this running repair work, plus waiting for frost to thaw on tents & evaporate, meant we only got going at 11:15. On the plus side, at least is was warmer & the sun was shining. Brief stop in Wellington to stock up with fresh supplies for lunch. Wellington is looking decidedly worse for wear. Lots of empty shops & glum looking locals. All this despite the new enlarged prison just outside of town. On to Gulgong - always one of my favourite towns on the route to Byron, and a great riding road to boot. Visited Flirtation Hill Lookout for the first time. Stunning panoramic views to the north. Lunch then back on the road to Coolah & Black Stump Rest Area. Another good stretch on the bikes, roads in good condition, little traffic, cool but pleasant weather & interesting countryside. I must have traveled this road at least 40 times over the last 30 years. 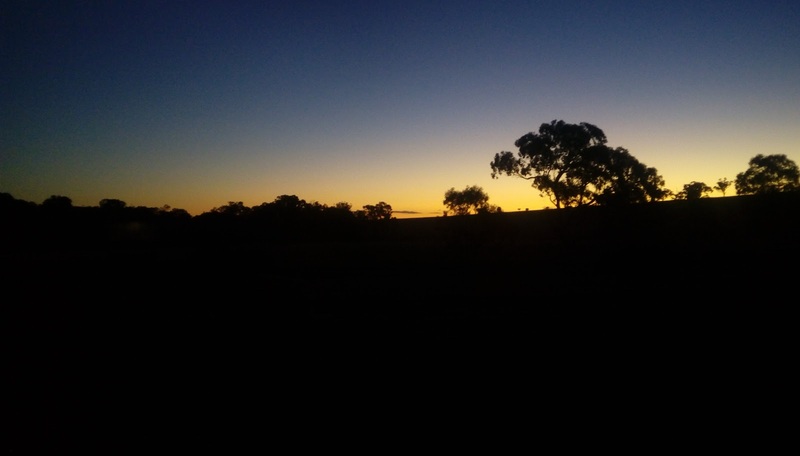 Black Stump Rest Area is on old favourite stopping point. Either for a leg stretch & food, or over the years on various trips to and from Byron as an overnight stop when driving by myself. Tents up and replace windsheild on mounts. By morning the epoxy will have well and truly cured. Hopefull our running repairs should last the rest of this trip! After consulting weather forcast, tomorrow we will start heading east towards the coast. Ursala has a sister in Nambucca Heads. Then north to Byron & UCC. Should get there in time for my birthday.